I remember liking Voltron: Defender of the Universe as a kid. However, I don’t remember ANYTHING about the original series. 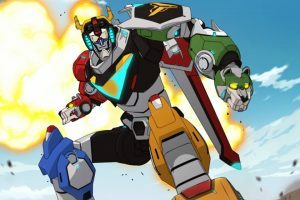 I enjoyed the 1998 Voltron: The Third Dimension, but I was a sucker for horrible 3D animation on TV (like Reboot and Beast Wars: Transformers). So recently when Voltron: Legendary Defender came to Netflix, I decided I needed to check it out. If you haven’t seen it yet, I suggest watching it before reading this article as there is a minor plot point I will be ruining. In Voltron: The Third Dimension, I recall liking Pidge because he was played by Billy West, and sounded exactly like Fry from Futurama. So when I started watching Voltron: Legendary Defender, I really liked Pidge as well. Pidge in this version is voiced by a female (Bex Taylor-Klaus), and looks very androgynous. This made me like the character even more. It needs to be said at this point, I watched most of the series one weekend I came down with a fever, and the majority was consumed with a fever. 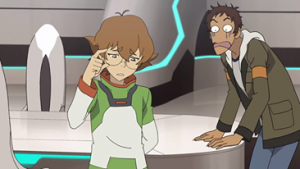 So when I tell you that I didn’t realize Pidge was actually a female character until halfway through the fifth episode, it’s because I was sick. I later went back and found out it is quite obvious at the end of the second episode. Pidge does get some mixed reactions. “WHAT YOU’RE A GIRL? !” from a slack-mouthed Lance (Jeremy Shada). “I’ve known for some time, but I’m glad you’ve shared it with everyone,” says the wise Princess Allura (Kimberly Brooks). “Yeah I figured,” from Hunk (Tyler Labine), and “Oh yeah, me too,” from Keith (Steven Yeun). “Wait we were supposed to think you were a boy?” from Rys Darby’s character Coran. Lance’s reaction is the most over the top, but the cartoonish reaction makes it more funny than sad. That’s it though, the whole thing is over just like that, and they move on to saving the day. While I’ve had good reactions so far from everyone I’ve come out to, I did have my own Lance response (see The Christmas Invasion). I know it’s impossible to hope for only positive responses, but now that all the really important people in my life know, I’m not worried about negative ones, I’ll just remove them from my life and move on. I have never seen Voltron (no surprise there) but I really like the comparison you make of the reactions to Pidge’s announcement to coming out as transgender.